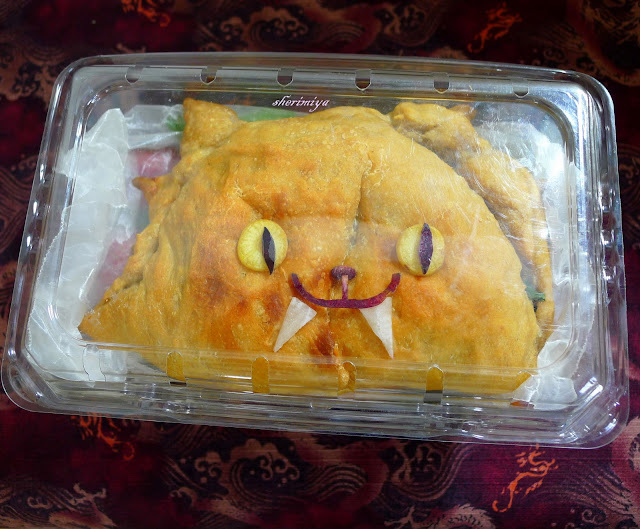 Werewolf Calzone Field Trip Bento, a photo by sherimiya ♥ on Flickr. MisterMan has a field trip to the wildlife museum, so I thought it would be appropriate to make a werewolf calzone for him to take for lunch. 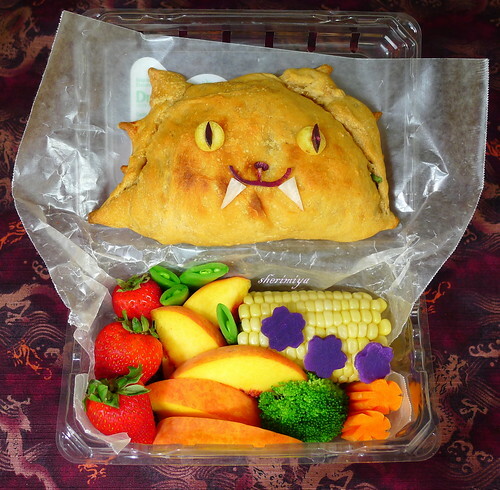 I think my last werewolf bento may have been cuter. Anyway, in addition, it fits in with the Halloween theme too. On the upside, my calzones are really starting to look calzone-shaped. On the downside, I guess it doesn't look all that werewolf-shaped, does it? I tried to make furry edges and pointy ears, but I didn't have enough extra dough for that. I hope the radish and yellow and purple carrot eyes, mouth, and fangs help. This one is stuffed with pepperoni, salami and ham, plus spinach, thin sliced zucchini, baby portobellas and cheese. I think it would be fun to form a plain roll (and easier too). Maybe I'll try that sometime. The rest of this disposable container holds corn, broccoli, carrots, Okinawan sweet potato, peapods, peaches, grapes and strawberries. I kept the calzone separate with the wax paper between. When I closed the box, he fit perfectly, peering out the window. RAWR! I love him looking out the top, that photo made me laugh at loud! Seeing that face was a great start to my morning, thank you! Haha! I love doing them. Practice will make perfect, right?? ^_^ Thanks Ꮮуռ (ᶬˠ ᶩᶤᵗᵗᶥᵋ ᵐᵋˢˢᵞ ᴻ ᶜʱᵋᵋᵏᵞ) ! Yummy! 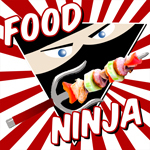 Check out the new bento meme at Bento Blog Network. This week's theme is Anything Goes and you can post your bento links until 8pm CST on Tuesday and then voting will be enabled for people to pick their favorite, which will become the featured bento of the following week. This theme specific meme is posted each Friday. Next week's theme will be Smiles. I like what you used for your travel container! I find myself in a similar situation a lot roadtripping. Unlike my coworkers who are fine with doing the fast food the whole trip long, I prefer to pack pasties and fruits and veggies- but your container gives me great ideas for packing whole road trip meals without having to worryabout finding a place to clean my box or have it clunking around a crowded car.